Philadelphia Bandleader Francis "Frank" Johnson, circa 1840. He was the John Philip Sousa of the Early Republic, The Duke Ellington of Ante-Bellum Philadelphia, "Leader of the Band at Balls, public and private, Sole Director of all Serenades, Inventor General of Cotillions," and leader of America's most popular band for more than twenty years. 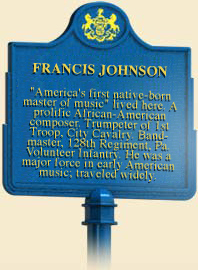 A black bugle player from Martinique, Frank Johnson first won fame playing military music - much of it his own compositions - for the State Fencibles, a troop of young Philadelphia aristocrats who, dressed in eye-popping military uniforms, toured the country marching and drilling for audiences caught up in the martial spirit that followed the War of 1812. Johnson's all-black band had a unique way of playing that delighted audiences, demonstrating what one enthusiastic fan called "a remarkable taste in distorting a sentimental, simple and beautiful song into a reel, jig, or country-dance." They didn't quite know what to call it in the 1820s and ‘30s. Seventy years later his syncopation would become known as the art of "jazzing." Combining African-American rhythms with the popular music of the day, Johnson's band soared in popularity and spawned a host of imitators among bandleaders of both races. Constantly in demand, Johnson expanded his band and reshaped its sound to fit each occasion, be it a ball for the local white aristocracy or a sacred music concert for Philadelphia's free black community. Frank Johnson's reputation grew at the same time that racial tensions, residential segregation, and discrimination were also on the rise in Philadelphia. As Irish immigrants shouldered free blacks out of jobs, Nativist riots and violence ravaged the city. Despite the rise of anti-black feeling, Frank Johnson's popularity continued to grow. 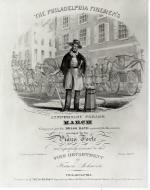 In 1838, the same year that Pennsylvania deprived African-American men of the right to vote, and an angry mob burned down Pennsylvania Hall for hosting an anti-slavery convention, Johnson and his band became the first group of American musicians to play in Europe, and capped off their triumphal tour with a command performance for England's young monarch, Queen Victoria. Returning home, they introduced Americans to Europe's two latest musical crazes, the waltzes of Johan Strauss and promenade concerts. The introduction of new chromatic, or keyed, brass instruments in the early 1800s made it much easier for musicians to change notes. Indeed, Johnson's success was also built on his mastery of a keyed bugle. In the decades that followed, a growing variety of brass, marching, and concert bands popped up across much if the nation. African-American, German, Italian, and family bands formed by the hundreds. In Pennsylvania almost every town boasted one or more amateur brass bands that played on the bandstands erected in town squares, and that provided the music at anniversaries, funerals, parades, sporting events - baseball pitcher Cy Young would note that "there were brass bands all over the place" during the 1903 World Series - and other public and private events. In the days before radio and the phonograph concert bands introduced many Pennsylvanians to the new songs being cranked out by the nation's flourishing sheet music industry, many of them composed by Pennsylvanians, including George Rosenkrans and Arthur Pryor, writer of the timeless novelty song, "A Whistler and His Dog." Each summer for more than twenty years, the Willow Grove amusement park, north of Philadelphia relied upon the incomparable concert band of the great John Philip Sousa, who married a Philadelphian, to draw the summer crowds. By the late 1800s the band craze supported a host of related businesses as instrument makers and uniform manufacturers industrialized their operations. Philadelphia was home to a thriving musical instrument industry that mass-produced inexpensive instruments for the amateur market, including J. W. Pepper, which in 1887 built a new factory in Williamsport. By then, too, Henderson and Company of Philadelphia was selling band uniforms with more than sixty different jacket styles. In the early 1900s, the emerging recording industry and radio would end professional concert and marching bands' prominence in the American music industry. The introduction of instrumental instruction in the nation's high schools, however, fostered a national school band movement during the 1920s. Today the music epitomized by Frank Johnson in the early 1800s, lives on in high school and college marching and concert bands across the Commonwealth and the nation. 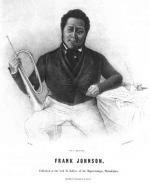 Cultural ambassador, master arranger and musical pioneer, Frank Johnson died at the age of fifty-six in 1844. At his funeral, a silver bugle presented by Queen Victoria as a token of her appreciation lay atop his casket. Margaret Hazen and Robert Hazen, The Music Men: An Illustrated History of Brass Bands in America, 1800-1920 (Washington, DC: Smithsonian Institution Press), 1987. Eric Ledell Smith, "Leader of the Band," Pennsylvania Heritage 25:3 (1999): 6-11.